Yo. Can I ask you a very random Smash-related question? AHHH REILA I'M SORRY I DIDN'T NOTICE THAT MY POST DIDN'T GO THROUGH. I typed it out while I was in a stadium during my graduation, and I suppose the signal ****ed up while sending it. So I do play online quite a bit, I recently made Elite smash with my Inkling (lol). As far as ledge cancelling, I'm not 100% sure what you mean... but I don't think I do it at all, or if I do, I don't realize it ha ha. With regards to the other stuff though, I don't tend to use splattershot all that often since I don't think it's terribly safe, but I will sometimes mix it into my mid-range game by doing retreating short hop splattershots. Even if you don't do it fast enough to airdodge in time, you're still landing without lag so you can throw out a jab or put up your shield. I use aerial Roller a little more often than that, but still not too much since it can be beat out somewhat easily. When it connects though, you're getting a nice two-hit combo off if you jump cancel and land an aerial after they're popped up. What I HAVE been using a lot more though is short hop reverse nair whenever I would do short hop double nair. Timed correctly, you can combo the first nair into a bair instead of a second nair, which nets about 5% more damage. You can also do full hop reverse nair into a fast fall bair for MORE damage. For example, dthrow > short hop reverse nair > bair > run up jab/dtilt/ftilt/utilt/grab > dthrow > full hop nair > sweetspot fair OR full hop reverse nair > sweetspot bair (but that's less damage than fair). after the first shrnair > bair, you might be able to get a roller bury off. Training mode says its a true combo, but I don't think so. I guess you can catch a roll away with it though. Anyway, that's a lot, but that's what came to mind... sorry again for such an absurdly late reply, but I hope I helped! Oh, one more thing. I guess at the right percents, you can also sometimes run up jab lock after shrnair bair, but it doesn't seem very reliable. jabs generally have more endlag in this game it seems, so if you try it, you're probably gonna do jab 1 > jab 2 instead of jab 1 > jab 1, so leave it at that, cause jab 3 definitely won't lock. Thanks. I will look for an example of the ledge cancelling thing later. All of that you said sounds very complicated, do you know if there are any videos showing those... let's say, more advanced tricks? I don't mean for Inklings in specific, but stuff that goes for most if not all fighters. Also, worry not, I just assumed you were really busy. which corrin skin do you use btw? Props to you for datamining Bayo's frame data so early. Truly a model for us all. I just want to say that your avatar and the images/gifs that you have are absolutely fantastic and I love them. That is all, have a nice day! Did I ever tell you that I watched a Hatsune Miku concert? 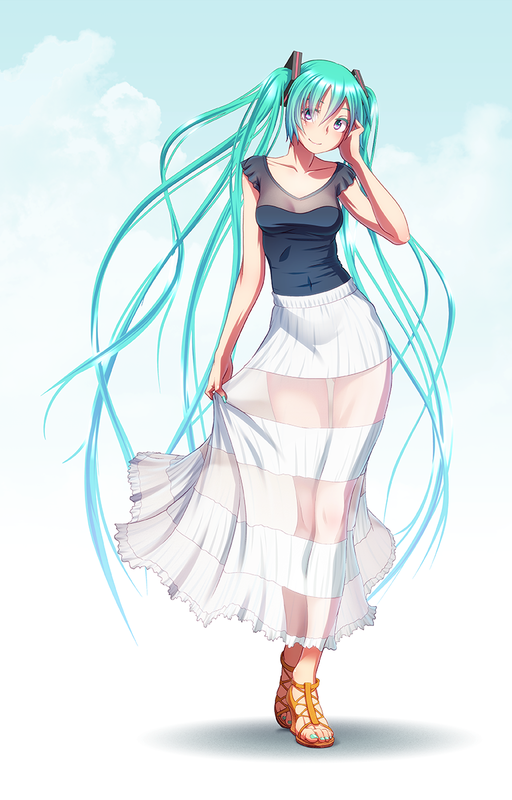 Your status is sorely out of date my dear Miku.